Im not the best concept artist but ill give this a shot in a few posts here. Hopefully you mappers find something useful. deck would work well with a ship at the top of the ramps... Ill make a few drawings detailing how it could work. This one is an overview. Last edited by the_hack; 01-17-2018, 06:18 PM. I love this take on Deck, though judging only by the video, I don't like very much the spacing. I'd bring it more towards the original layout, and focus on the theme. The pool on the bottom could be the water between the "ship" and the deck itself, with wooden planks floating on both sides (that lead to the rocket launcher). The elevator/redeemer section could be an extension of the deck. The sniper/uDamage/rocket section I don't really know, but could work as the back of another ship docked right between the big ship and the dock. Quick edit: Just something that passed through my mind now. The elevator area could be a sort of carrier for containers on the deck. Beyond the elevator would be an open area (not accessible) with lots of containers. The containers get loaded onto the elevadors, they're taken to the floor above, and carried on conveyor belts to the right, towards the ship. This section (where the bio rifle is, I think) could work as a loading area on the ship. Anyway, just throwing some thoughts around. Last edited by Izangar; 04-12-2018, 05:44 PM. Started shelling out. I've referenced the current deck for the width of the goo pit - but that's about it. Currently I've focused on testing the concept , which seems to work in its very basic current expression, and to get the scale I want for this map, which I hope to be better for 1v1 and smaller DMs. Some big changes - there is only one of each weapon. 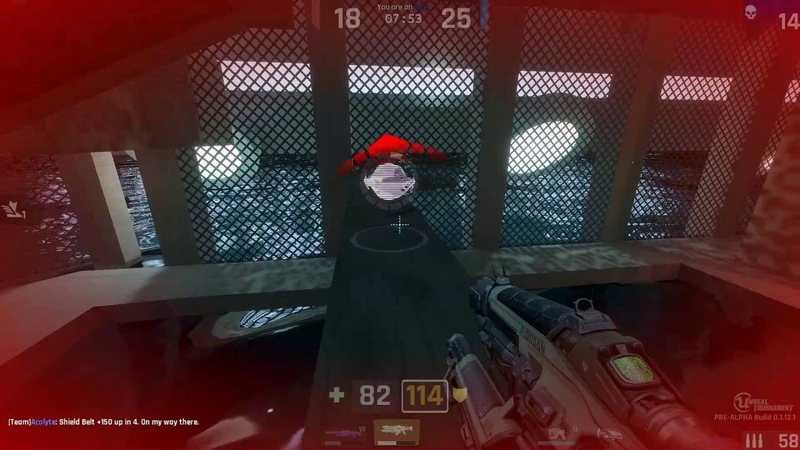 Teleporter doesn't exit directly above 100a. Weapon types are spread around the map diametrically (rather than similar weapons being close, with the exception of link and mini which remain in the same place). Flak/small armor corridor has been minimized. The main room is shorter and there are less ramps. Other small changes may be deliberate or incidental at this stage, I will move forward by referencing current decktest so the layout and sizes of individual areas matches as much as possible. Currently it kind of does but a lot doesn't. Last edited by the_hack; 01-17-2018, 06:26 AM. I'm going to start shelling this out soon. I've settled on the idea of an old, dock with some tacked on futuristic elements, and a futuristic ship. Would anyone like to help with meshing after? I don't do that! Yeah, just want to echo the sentiment about how this looks like how it should have been from the start. Almost like the tech wasn't there, and so it was left a shell, and now it can be done right. Or like every other iteration simply avoided this obvious rendition as per the pain volumes not fitting. If I could contribute anything in support of this rendition, it would be that I wouldn't miss the pain volumes, nor do I think it would severely hurt game play if they were gone. The water alone is a death trap just for how it effects your movement, and forcing an opponent to be there to insure the damage would be just fine, all things considered. At this point, I feel the pain volume damage is just insult to injury. Everything makes sense now. While I like the idea of playing on a deck of a giant spaceship, none of the Deck maps really look like they're located inside a spaceship. This is just perfect. Last edited by Ormu; 11-24-2016, 12:21 PM. How about having this harbour and ship be located in a sea of very dense liquid nitrogen? Never really a big fan of the green goo but thought it was something kinda iconic to this map. Very cool concept! I like the idea of mixing old stuff with future elements. This should be a standard approach for many designs in this game. I like it, great idea. As per sky's idea for nitrogen. Luckily still had all the layers so just a few hue/sat tweaks. Bit too dark overall tho. Ps have stopped working on this, anyone free to take over and make something based on the concept. Hope they go with slys vision in the previous post. The nitrogen sea will enough to make it unreal... the impication o the an old deck and ship would be that a culture at a similar level of development to ours, Had experienced an environmental meltdown. So perhaps it could all look very cold and deserted. Probably the scenne would look nice if lit by a dusk or sunset, so quite nice above but dismal below. This idea is so obvious that I'm surprised nobody (myself included) came up with that yet. Though something feels lacking yet. I think it would benefit from some fantastic aspect to it. What about blending scifi with classical ship architecture and functionality by making it a highly advanced metal sailing ship (justified by strong winds with static direction on that planet maybe?). And as for the liquid, water might be too boring. This would create a very interesting atmosphere (cold fog near the liquid, frozen walls on lower levels but sunshine and strong winds throwing cloths around on the upper levels) and a rare blending of old ship architecture with sci fi and introduce a new element into the remake series of Decks. Not to mention, if someone bothers to program and animate freeze deaths with breaking player models, this could make for spectacular deaths! Just throwing some ideas in. Doesn't have to make that much sense, but it got to be interesting after all. This is a game in the Unreal setting, unreal settings are never wrong! Last edited by Sly. ; 08-03-2016, 01:16 PM.